I'm super excited to share these jello shots on the blog today for a number of different reasons. 2.) They're perfect for fall. These are somewhat similar in look and ingredients to my Caramel Apple Jello Shots, but I actually prefer them with bourbon for a slightly smokey, warm-your-belly-on-a-brisk-fall-day type of feeling. The bourbon makes for a decidedly boozy tasting shot, so I only used 3/4 cup for a batch of 16 shots (but you could even lessen it to a half cup.) 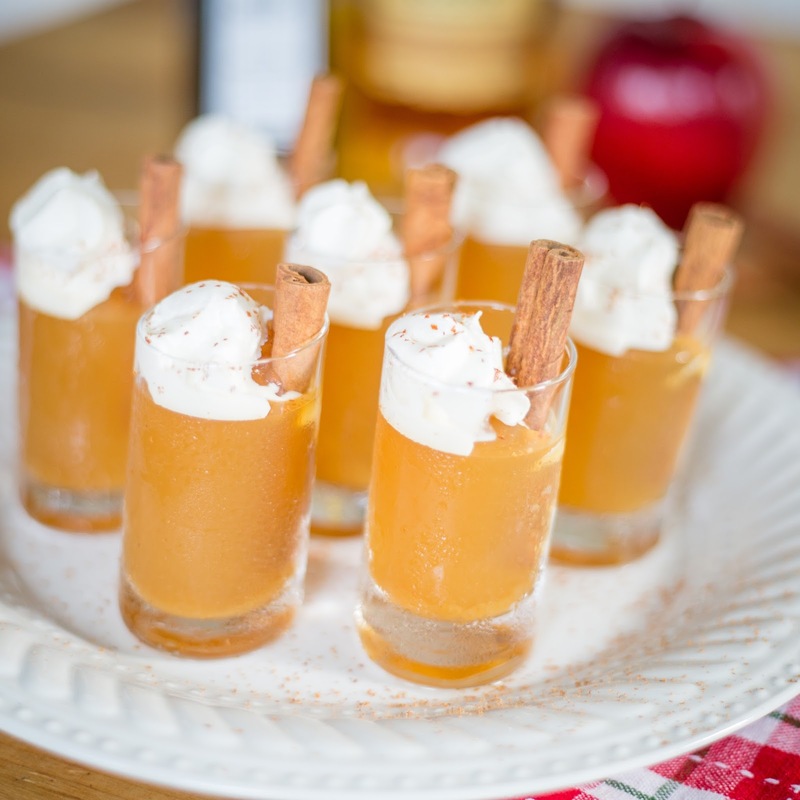 Don't skip the whipped cream topping... it will help cut the alcohol a little and mix with the shots for a creamy, sweet bite as well as make for a beautiful presentation. 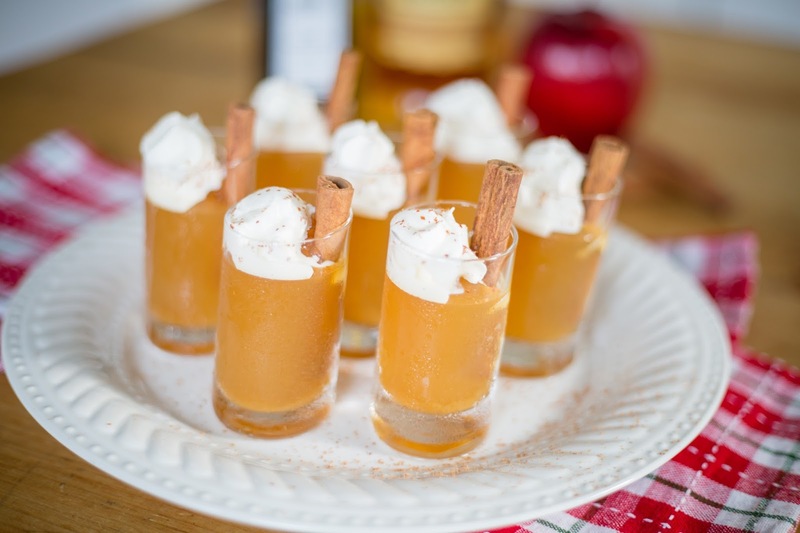 The cinnamon sticks will help for dislodging the shots and make a cute garnish. These would be perfect for a fall football tailgate or a Sunday afternoon of watching football with friends. Speaking of which.... I will be doing exactly that on October 16th. I'm super excited to be hosting an event at this year's New York Wine and Food Festival. This event, Game Day Eats, combines two of my biggest passions: food and sports! It will be held at Hill Country BBQ in Brooklyn, with a variety of football favorites such as wings, BBQ, nachos and much more made by chefs from around the city. I'm teaming up with Chef Charles from Hill Country, putting a fun spin on some of my favorite football eats from the blog. And of course, you can sample all of this awesome food while watching your favorite teams play on Hill Country's big screens. The best part about any of the events that weekend... all proceeds benefit No Kid Hungry, an organization aimed at ending childhood hunger. If you would like to purchase tickets, click here. But in the meantime, you can get a taste for what we're cooking up by making the jello shots! Combine cider, maple syrup and lemon juice in a small saucepan. Sprinkle with unflavored gelatin and allow it to soak in a minute or two. Heat on medium, stirring constantly until gelatin has dissolved. Strain into a large measuring cup (to eliminate any solids from the lemon juice) and stir in bourbon. Pour into 16 shot glasses, leaving room at the top for whipped cream. Refrigerate 4 hours or overnight. Immediately before serving, insert a cinnamon stick into the side of each shot. Top with whipped cream and sprinkle with freshly grated cinnamon. Enjoy! This sounds like an adventure...even though I usually have my bourbon with water or coke! !...enjoy your work on sportscenter to start my day...cheers!! This sounds like an adventure... even though I normally drink bourbon with coke or water!!.. enjoy your work on sportscenter as I start my day... cheers! !